I like the ASP.NET 2.0 DataSource controls. They are very flexible and easy to use. It has some great parameters like SessionParameter and ControlParameter. It doesn't have a ViewStateParameter. I have written it myself to fill this gap. My solution uses Reflection to retrieve the ViewState out of the Page. You will need FullTrust to use the code, bummer. Download the source + sample website here. I have developed a small website which uses Google Maps to prepare myself for a new project. Have a look here. I have used GoogleMaps.Subgurim.NET to simplify things. 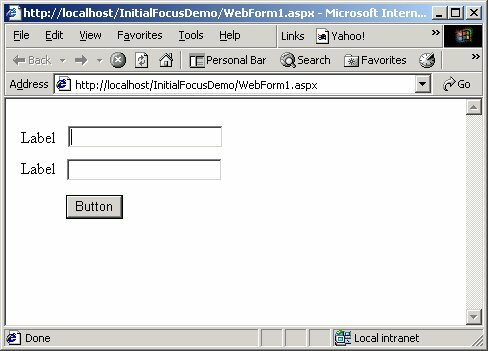 This is an ASP.NET control which encapsulates the Google Maps API. Their site is in Spanish but with Babel Fish you can translate it to English. I have finally found some time to play with Ajax. I have built some simple Grid/Detail pages which are place inside an UpdatePanel. This server centric model is really easy and powerful. I have never really liked the user experience of web applications. Atlas will changes this and will make the WEB even more popular. Have a look at the result demo site. I use the ObjectDataSource to bind to Buffy.NET BusinessObjects. It's so easy. It wasn't really difficult to do. Microsoft really kept their promise that 70% of the code could disappear. ASP.NET 2.0 rocks. I'm planning to add some extra features soon, like: WebParts, Health Monitoring, other new controls, comments on blog posts, a new stylesheet and a new logo. Update 2006-sept-25: Added Google Sitemaps, Control Adapters and UrlRewritingNet. I have written a small content management system using ASP.NET. Sjef de Corte has implemented 3 websites with it. Well done Sjef! /// 'as is' and no warranties are made by the author. // Postpone setting the InitialFocus to the PreRender event of the control. // The control might not yet have a Page property, in PreRender it always has! Textbox1 has the focus after the page is loaded. Philip Quirke who reported a bug in an earlier version. I used the controls 'UniqueID' property instead of 'ClientID' in the SetInitialFocus() method. Scott Dinwiddie who reported the SmartNavigation problem. Waylon Campbell who reported the RadioButtonList problem. The standard ASP.NET DataGrid control is a great control. You can use it for many things, it even supports Paging and Column Sorting. Those last two option although work using postbacks to the server. Internet Explorer 5.0 (and higher) support XML Client-side Data-Binding. This is a powerful DHTML feature which is not used in the .NET Framework. It allows. The following grid is a DataIslandGrid which is bound to the Authors table of the SQLServer pubs database. The Html of this page must have redirective to the DataIslandGridProject. Then you can add the DataIslandGrid control to the Page. The best way to do this is by adding the assembly to your Toolbox. You then can drag&drop the DataIslandGrid from your Toolbox onto your Page. 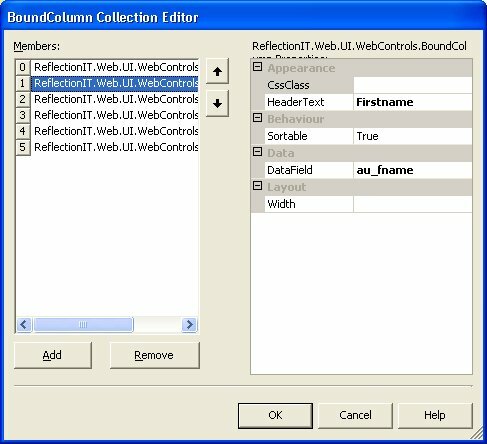 You add Columns to the datagrid using the BoundColumn Collection Editor. The following code binds the DataGrid to the Authors table. I have converted the SQLServer table to an MS Access database to make testing easier. The DataTable from the DataSet is rendered to an Xml DataIsland using the WriteXml() method of the DataSet. For each Column a table cell (<td>) is rendered within a <tbody> section. In this Cell a <div> tag is rendered with a datafld attribute which is set to the DataField property. A <tfoot> section is rendered with four hyperlinks for paging: MoveFirst, MovePrevious, MoveNext and MoveLast. /// the content to be rendered on the client. You can configure the appearance of the DataGrid easily by assigning a stylesheet classname to the CssClass property of the DataGrid and its BoundColumns. I have also included a DataIslandGridDesigner class which renders the design-time html. The Internet Explorer features for Data-Binding to Xml DataIslands are very powerful. The DataIslandGrid control makes it easy to use them in a ASP.NET application. It demonstrates the power of .NET controls.